Performers include: Reese Witherspoon, Nicole Kidman, Shailene Woodley, Laura Dern, Zoë Kravitz, Alexander Skarsgård, Adam Scott, James Tupper, Jeffrey Nordling, Santiago Cabrera, P.J. Byrne, Virginia Kull, Kathryn Newton, Cameron Crovetti, Nicholas Crovetti, Chloe Coleman, Ivy George, and Iain Armitage. 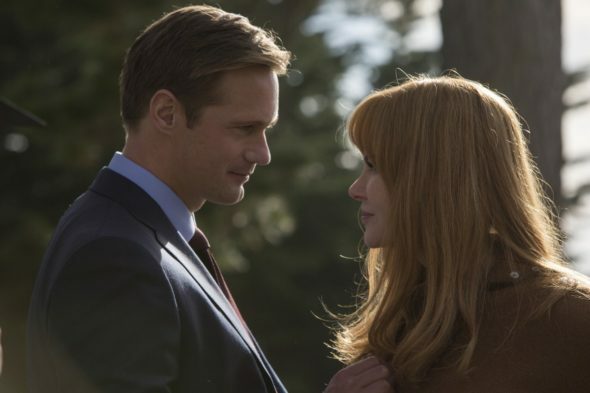 Based on the Liane Moriarty novel, the Big Little Lies TV show unfolds in the serene seaside setting of Monterey, California, where nothing is just how it seems. How many lies surround these seemingly perfect families? Told from the points of view of mothers Madeline Martha Mackenzie (Reese Witherspoon), Celeste Wright (Nicole Kidman), and Jane Chapman (Shailene Woodley), this dark, comedy-drama portrays a rumor-driven community of haves and have-nots. Conflicts, secrets, and double-dealings are revealed, which makes a big impact on all sorts of relationships. The high-energy Madeline means well, but her drive to make things better results in unwelcome results. Steady, affectionate Ed Mackenzie (Adam Scott) is her second husband. He struggles with feeling of inferiority. Unlike Madeline, Ed is risk averse. Together, they’re raising Abigail (Kathryn Newton) and Chloe (Darby Camp). Tall, lovely, and wealthy, Celeste leads a seemingly enviable existence. She is married to Perry (Alexander Skarsgård), a successful business man and devoted father to their twin sons, Max and Josh. Struggling single mom Jane (Shailene Woodley) carries some mysterious baggage from the past. She is new to both Monterey and the social politics at her son Ziggy’s (Iain Armitage) school, Otter Bay Elementary. Influential career woman, Renata Klein (Laura Dern), leads an anti-bullying campaign at the school. Her husband, business executive Gordon (Jeffrey Nordling) loves and supports his wife personally and professionally, but doesn’t always understand her or her choices. They’re the parents of Amabella (Ivy George). Nathan Carlson (James Tupper), is Madeline’s first husband. He has since remarried Bonnie (Zoë Kravitz), a beautiful, young, yoga teacher, and they have a daughter named Skye (Chloe Coleman). Bonnie is an empathetic woman with a strong moral compass. Nathan also shares a teenage daughter with his ex. What do you think? Do you like the Big Little Lies TV show? Do you think it should be renewed or cancelled for another season on HBO? Although a late bloomer to the viewing scene…. yes, yes and yes! Love it need another season. First good series in a long time. I really hope you do another season!! Yes I loved this show. Love love love this show please bring on more seasons please! Need a second season!!! Absolutely loved the first! I’m am waiting and hoping for a second and third and fourth and etc.!! !